"Have you got the Sack to be an Underwater Welder?" So you think you might want to be an underwater welder? For your convenience, on this page is a list of underwater welding schools along with links to their web sites. But....There are a few things you need to know before you take the plunge (no pun intended). Not all underwater welders make six figures. Some make more…some don’t even come close. Underwater welding jobs are typically available on a project by project basis and how much you make really depends on how much you are willing to work and whether you get connected to the right people. Not all underwater welding jobs are as glamorous as the pictures you see on the web. Tuition is going to be at least 14,000 dollars plus room and board, in some cases, the training courses are 16 weeks long working 10 hour days. Oh yeah, you are going to have to buy a whole bunch of gear too. That could add up to a few thousand more dollars. Again I am not trying to discourage anyone from becoming an underwater welder. I am just trying to paint an honest picture of the expenses and the commitment it takes along with the real life working conditions that you might encounter. If becoming an underwater welder is what you want to do, if you cant think about anything else, if the idea of being away from friends and family, kids and wife… for months at a time does not even make you flinch, if you have the sack to go underwater and feel your way around in the dark…then by all means go for it. You are the alpha dog. If you are willing to give it your all, there is no doubt you can make a ton of money. 20,000 dollars in tuition and gear, give or take a few thousand, is small potatoes compared to the kind of money you can make. How many college boys do you think make six figures right out of the gate? And if you are single, being able to tell that hot blonde at the bar that you are an underwater welder has got to be worth something. Still here?You must be serious! 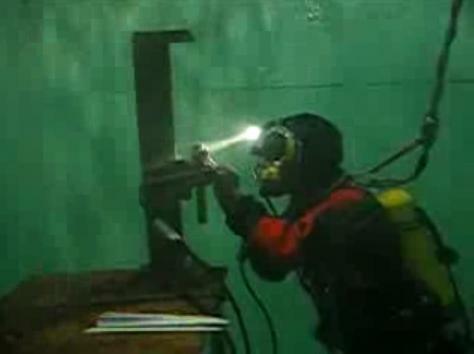 Now that you have decided to become an underwater welder, lets have a look at the list of underwater welding schools. Located in Prince Edward Island, Holland College offers a complete underwater welding program including all the diving courses like diving physics, diver fitness, decompression, etc . as well as welding and cutting safety and welding skills training. 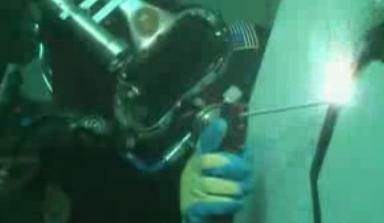 Also Hyperbaric chamber operation. Located in Jacksonville FLCommercial diving academy offers several training modules like underwater welding specialist, underwater cutting specialist, as well as the mac daddy training package …the air/mixed gas commercial Specialist which includes welding, rigging and weld inspection. Located in Washington state. Divers Institute of Technology states that experienced commercial divers can make $200,000 a year. 20 week underwater wet welding course in accordance with the internationally recognized underwater welding specification, ANSI/AWS D3.6-93.